माझे मौन सोडण्याचे विचार सुरु झालेत. येणाऱ्या ३ ते ४ दिवसात मौन सोडण्याचा विचार करतो आहे कारण माझ्या ब्लॉगवरून ज्या अर्थी कोट्यावधी जनता वाचक झाली आहे त्या अर्थी अधिक मौन न बाळगता त्यांच्याशी खुलेआम चर्चा करणे मला अधिक महत्त्वाच वाटतं. देशभर दौरे करून जे तरूण-तरुणी, शाळेतील मुले, शेतकरी, कामगार वर्ग, स्त्रिया व पुरुष यांनी ह्या आंदोलनाला जगभर साथ देऊन रस्त्यावर येऊन आंदोलने केली, प्रसंगी जेल मध्ये गेले, संकटांना सामोरे गेले. त्या सर्वांना पाहायची आणि त्यांच्याशी बोलण्याची माझीही तीव्र इच्छा झालेली आहे. त्यामुळे लवकरच मौन सोडून त्यांच्याशी चर्चा करण्यासाठी विविध राज्यांचे दौरे मी आता आयोजित करत आहे. अशा दौऱ्यांमुळे मागील आंदोलनामध्ये ज्याप्रमाणे मला जनतेमधून खास करून युवक-युवतींकडून जी उर्जा प्राप्त झाली होती तशीच उर्जा मला मिळत राहिल व या उर्जेच्या बळावर मी ‘जनलोकपाल’ कायदा होईपर्यंत व नंतर ‘Right to Reject’ (नकार देण्याचा अधिकार) and ‘Right to Recall’ (परत बोलावण्याचा अधिकार) होईपर्यंत लढत पुढे जाणार आहे. देशातील तुम्ही सर्वजण थेट माझ्या बरोबर असालच! जय हिंद! इन्कलाब जिंदाबाद! वन्दे मातरम! भारत माता की जय! मौन सोडण्यासाठी प्रकृती अनुकूल झालेली नाही. अजून पायाला सूज असून गुडघ्याचा त्रास होतो आहे. मौन धरल्याने, बोलणे बंद असल्याने शरीर-प्रकृतीसाठी योग्य आहे. जनतेशी बोलणे सुरु झाले की अशक्तपणा जाणवतो. म्हणून मी शरीर प्रकृतीचा अंदाज घेऊन निर्णय घेत आहे. I thank you all for coming together from all over the country to lend your voice for effective implementation of Janlokpal Bill. I wish you all a very Happy Dipavali! You are igniting the light of hope as this deep dark night leads us in to a brighter tomorrow. We have to fight to drive away the darkness of Corruption from the hearts of millions. We will celebrate Dipavali in true sense on the day when Janlokpal Bill will be implemented. That Dipavali will enlighten us from within and outside. This year we are celebrating Dipavali like every year but this time around let us try to celebrate ‘that’ Dipavali. The people who are exploding crackers of accusations and counter-accusations today, I hope ‘that’ Dipavali seals their lips. I hope to see them joining us in ‘that’ Dipavali celebrations. Once again my best wishes for Dipavali to all my countrymen! ‘जनलोकपाल’ बिलाच्या कायद्यासाठी देशभरातून आपण सर्व बंधू-भगिनी सहभागी झालात. आपणा सर्वांना दिपावलीच्या हार्दिक शुभेच्छा. अमावस्येच्या काळ्या-कुट्ट अशा अंधाऱ्या रात्री दिप प्रज्वलित करून आपण सर्वांनाच प्रकाश प्राप्त करून देत आहात. मात्र अजुनही भ्रष्टाचारामुळे असंख्य माणसांच्या अंत:करणातील अंध:कार घालविण्यासाठी आपण सर्व जण प्रयत्न करू या. ज्या दिवशी ‘जनलोकपाल’ बिलाचा कायदा होईल, त्या दिवशी आपण खऱ्या अर्थाने दिपावली साजरी करूया. ती दिपावली माणसांच्या अंतर्बाह्याला प्रकाश देणारी दिपावली असेल. सालाबाद प्रमाणे ही दिपावली साजरी करीत असताना ती प्रकाशमय दिपावली साजरी करण्याचा प्रयत्न करूया. या दिपावली मध्ये जी माणसे आरोप-प्रत्यारोपांचे फटाकडे वाजवित आहेत, त्या दिपावलीच्या दिवशी त्यांची तोंडे बंद झालेली असतील आणि आपल्या दिपावलीच्या सणामध्ये तेही सहभागी झालेले असतील. पुन्हा एकदा सर्व देश बांधवांना दिपावलीच्या हार्दिक शुभेच्छा ! Kiran Bedi has been accused of being involved in air-travel corruption. She has time and again made it clear that if she has done such a thing and used the money for the benefit of her family then the government should take help of one of its own inquiry agencies and if found guilty should take stringent actions against her. But the government doesn’t seem forthcoming in taking such a step. To accuse and humiliate seems to be the mantra of the few. This is not the first time that such accusations have been leveled against Kiran Bedi. Every member of ‘Team Anna’ had to face accusations and character assassination by the ‘gang of four’. Who are these people? Those are the very same people who are not in favor of Janlokpal Bill. Let’s give it a thought to the initial days of the movement when Joint Committee was to be formed to draft Janlokpal Bill. Who were the people opposing the Committee? You will realize these were the very same ‘gang of four’ who stood in opposition. After much deliberation on 5th April 2011 I began my fast on Jantar mantar where people gathered in large numbers. It was then they realized their mistake and agreed to form a ‘Joint Committee’. On 4th June 2011 as Ramdev Baba’s agitation was in progress on Ramlila Maidan I was supposed to meet him on the following day i.e. 5th June 2011. But on the night of 4th June 2011, at 1:30 pm the Delhi police launched a brutal attack on the unsuspecting crowd of men and women old and young alike and innocent children. The Government’s intention was clear-‘Anna Hazare and Ramdev Baba should not meet’. By ruthlessly beating up women was the Delhi police trying to prove they are man enough? Who were these men who did lathi charge on the women? Those were the same people who are now playing accusatory games aren’t they? The mystery will surely unfold. Joint Committee was formed but these people did not want the Janlokpal Bill passed. This ‘gang of four’ now started accusing Shri. Shanti Bhushan and Shri. Prashant Bhushan on the CD issue. Like Kiran Bedi, Shri. Shanti Bhushan and Shri. Prashant Bhushan too maintained their stand on being innocent and asked the government to conduct an enquiry in to the matter. But these people are aware that their aim will not be fulfilled if they follow the legal path. The only way out was to spread dissention in ‘Team Anna’ thereby spreading misconceptions among people who will be dissuaded from participating in the movement. One of the honest members of Team Anna, retired Judge Shri Hegde Saheb who was responsible for sending the BJP Chief-Minister behind bars was also accused. Who were these people? You will soon understand that these were the same ‘gang of four.’ Accusations were leveled against Arvind Kejriwal and he was attacked with slipper in one of his gatherings. Who was behind this act? On 16th August 2011, I was to hold a demonstration in Delhi demanding the government pass the Janlokpal Bill. It was for more than a month that I was trying to seek permission for obtaining a venue for the same through letters and personal visits. But purposefully we were not assigned a place for my fast and the matter was stretched until 15th August 2011. They applied IPC 144 on all the public places in Delhi. Finally we decided we will get ourselves arrested and go on fast in jail. The ‘gang of four’ were behind this conspiracy is now clear. Early morning at 6’0 clock on 16th August 2011, I was arrested from my house. I had not committed any crime hence they had no right to arrest me from my house. These people wanted to humiliate me intentionally. I was sent to Tihar Jail. It was four in the afternoon till necessary formalities were completed and we were taken in to Tihar Jail. We were allotted one room, set of clothes and at 6:00 pm an officer came with the news that my sentence was pardoned and I was free to leave. We have been directed to leave you at the place where you were arrested from. I was surprised as the government had arrested me because my protest was causing disharmony and within next two hours I was set free! Had the government had some sort of divine intervention? Is this government a joke? You arrest someone at your whim and then set them free. Is this democracy? The police resorted to lathi charge on the peaceful protestors and whisked away Ramdev Baba to Haridwar in the middle of the night at 2:00 am by plane and was prohibited from stepping in to Delhi. His movement was crushed and now the ‘gang of four’ wanted to do the same to me. Their plan was to release me from jail and under the pretext of taking me home bundle me in to a car and take me to Delhi airport where an air-force plane was waiting to taxi out. Next I was to be flown to Pune and kept at unknown place; all this to thwart my movement in Delhi. Who was behind this conspiracy? These were the same people who were spreading derogatory remarks about ‘Team Anna’. Their conscious is not clear. I was suspicious right from the beginning when the jail authorities planned to release me within two hours of my arrest. I flatly refused to leave the jail premises. I told them if I was given a seven day sentence then I will stay in jail for seven days. The said officer passed on my message to the senior D.I.G who said I had come out of the jail to meet him in his office hence I cannot go back. I replied, ‘I came here because you wanted to speak to me and now you say I cannot go back, this is wrong on your part. You are not letting me go back in the prison neither I am stepping out of the prison gate. You have to push me or else carry me out.’ I refused to budge out of the jail. Thus the tables were overturned on the ‘gang of four’ as the officers carried out discussions with the government past one in the night. My decision had landed them in trouble. They were clueless as to what was to be done. For the next three days I was neither in jail nor outside jail. I was in D.I.G’s office. I had not had my bath for three days as there was no bathing facility there. Thus the people realized that the government had covert plan in its mind and hence the people lost their temper. The ‘gang of four’ had conspired to put me in jail so that they can cast aspersions on my team. The government had no alternative but to grant permission to carry out my agitation on Ramlila grounds. When I came out of the jail I was overwhelmed by the large crowd that had gathered there. Whenever the ‘gang of four’ tried to play mischief their tables were overturned and once again they found themselves on the receiving end. For the next two and half months Joint Committee met seven times. The issues raised by Team Anna were discussed at length and then they did a turn-a-about. We will present your draft of Janlokpal Bill before the cabinet they assured us but in reality they presented government’s weak draft which had deadly loopholes in the issue bypassing what we had to say. I do not blame all the ministers from the Congress party or the Government as a whole. There are some righteous and committed people in the government but they cannot raise their voice because of this ‘gang of four’. We are dashing off letters to all our members that saints, Mahatma’s, Prophets and Great men had to endure hardships and criticism when they tried to do good to humanity. (I appeal to my closer ones) Please do not react again and again on any or repeated allegations made by the ‘gang of four’ (and their agents from various fields). People are wise enough to understand what the truth is. Thus it becomes futile on their part. Corruption has driven people to their brink. People are weary of the rising corruption level. That is the reason the people of this country are unhappy with the present government. Corruption has given way to inflation. It is becoming difficult for the common man to run his house. The common man understands we are fighting for his sake. Hence no matter how many aspersions are cast on us people’s support for us will remain undeterred. We have to move ahead through the obstacles. People who chose the path of righteousness always have to face difficulties. But truth has always prevailed as seen in history. So we should keep walking the path of truth. The only thought that keeps us going and binds us together is it doesn’t matter if someone is trying to spread dissent in the ‘Team Anna’ or maligning our reputation. Why do people stoop so such low level? They have their own reasons. They are afraid if Janlokpal Bill is passed they will be stripped off their power. They will no longer be able to take bribe. Hence under any circumstances they will see to it that the Janlokpal Bill as a law does not come in to existence. They will keep blaming Team Anna so they can go on doing corruption. The number of Ministers who are opposing Janlokpal Bill in Cabinet is handful. It is similar to a village where there are 2 to 4 goons who hold the entire village to ransom. In government there is a majority of people who are righteous but can’t go against these ruffians. Leaving aside these specific 4 to 6 people no one points a finger at us. Prime Minister Manmohan Singh has assured us in writing that he will pass a law in favor of Janlokpal Bill during this winter session. He has also given this assurance before television channels. Shri. Salman Khurshid too has promised people that he will see to it that Janlokpal Bill is passed during the winter session. This shows that righteous people are in majority as to ‘gang of four’. 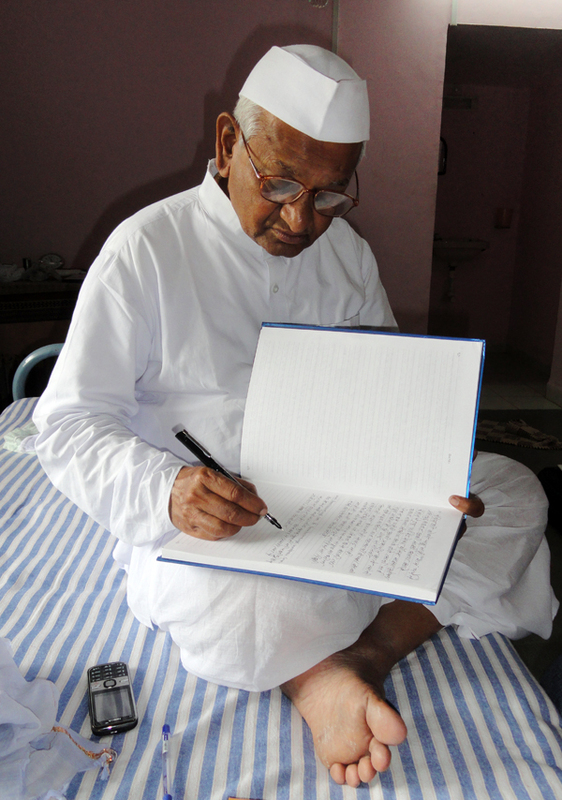 The way these people are leveling allegations against Team Anna it shows they are not bothered for the well-being of our nation or society at large. They are casting aspersions on others for their own selfish interests. They are quite capable of pressurizing the government not to bring Janlokpal Bill and if need be might take help of the handful belonging to the opposition party. But I think this storm will give birth to Lalbahadur Shastri’s Congress, Vallabh Bhai Patel’s Congress and Kamraj’s Congress. Today people will carefully sort out the unwanted from the list and this to happen is the need of the hour. In order to achieve a bright future and corruption free India the country and its country men have to do this. If need be I too will tour the nation and campaign for the cause. I will be writing a letter to Prime Minister Manmohan Singh that the draft for the Janlokpal Bill to be passed should be put on the internet so that people can have a look at it and not limit it to the Joint Committee. Late Prime Minister Shri. Rajiv Gandhi before making amendments in the 73rd and 74rth Act had sent a letter to 5.5 lac villages to call for Gramsabha vote. When we speak about democracy, Independence and Republic we have to take the people of this country in confidence before any law is drafted. But as per Prime Minister and the other Ministers assurances I have kept on hold my agitation till the winter session. If the law is not passed in the winter session then I will tour the five places where assembly elections are due to be held and then tour the rest of India during national elections. People should make it a point that they form a resolution on the Janlokpal Bill to be passed in Winter Session or else we will once again agitate and send it across through their village panchayat and Gramsabha to Manmohan Singh, Sonia Gandhi and to the President. From all over India 35 to 40 lac resolutions should reach the government. When resolution for Lokpal Bill is passed a bill for Lokayukt should be brought and the state’s Chief-Minister, Governor should pass a resolution for this purpose. The directives for Lokayukt Bill will be sent on behalf of the Government. Before that a resolution comprising of our demands should be sent to the Chief-Minister and the Governor of our own state. We are short on time hence please send the said resolution as soon as possible. Those who are trying to create mischief will learn a lesson. This is the only opportunity we have in order to get a corruption free India, ‘now or never’. If the Government goes back on its word and refrains from passing the Janlokpal Bill then it will have to face much more damage than they are facing now. But if a stringent Janlokpal Bill is passed then the government will be able to bounce back from the damage it has faced till now. For the past 25 to 30 years I have led agitations without taking in to consideration any political party, person, part of society, state but have always kept in mind the well-being of the nation. Henceforth my agitations won’t be any different. Inquilab Zindabad! Vande Mataram! Bharat Mata Ki Jai! किरण बेदीवर हवाई प्रवासामध्ये भ्रष्टाचार केल्याचे आरोप होत आहेत, किरण बेदींनी वेळोवेळी हे स्पष्ट केले आहे की, हवाई प्रवासामध्ये मी भ्रष्टाचार करून माझ्या कुटुंबासाठी पैसा वापरला असला तर सरकारकडे ज्या चौकशी यंत्रणा आहेत, अशा यंत्रणेमार्फत चौकशी करण्यात यावी आणि मी दोषी असेन तर माझ्यावर कठोर कार्यवाही करा. मात्र अशी चौकशी करायला सरकार तयार नाही, फक्त आरोप करून बदनाम करणे एवढयाच उद्देशाने काही लोकांनी उद्योग सुरू केलेला दिसतो. किरण बेदीवर झालेला आरोप हा नवीन आरोप नाही. तर ‘टीम अण्णा’मधील प्रत्येक जणावर आरोप करून ‘टीम अण्णा’ला बदनाम करण्याचा प्रयत्न या चौकडीकडून झालेला आहे. ही आरोप करणारी मंडळी कोण? ज्यांना ‘ जनलोकपाल’ बिल नको आहे. अशीच मंडळी या आरोप करणार्‍यांमध्ये असल्याचे दिसून येते.सुरवातीपासूनचे उदाहरण पाहिले तर लक्षात येईल की , जेव्हा ‘जनलोकपाल’ बिलाचा मसुदा करण्यासाठी संयुक्त समिती करावयाची होती. त्या संयुक्त समितीला विरोध करणारे कोण? लक्षात येईल की हीच चौकडी होती. नाइलाजास्तव ०५ एप्रिल २०११ रोजी जंतर-मंतरवर माझे उपोषण झाले व देशातील जनता मोठया प्रमाणावर रस्त्यावर उतरली तेव्हा त्यांची चुक त्यांच्या लक्षात आली आणि संयुक्त समिती करण्यास तयार झाले.दिनांक ४ जून २०११ रोजी रामदेवबाबांचे आंदोलन रामलिला मैदानावर चालू असतांना माझी व रामदेवबाबांची भेट दिनांक ५ जून रोजी होणार होती. आम्हा दोघांना एकत्र येऊ नये म्हणून दिनांक ४ जूनच्या रात्री दिड वाजता आंदोलनात सहभागी झालेल्या महिला, पुरूष, मुले यांच्यावर अमानुष लाठी हल्ला करण्यात आला. निष्पाप महिलांवर लाठी चार्ज करणे हाच पुरूषार्थ आहे का? असा प्रश्‍न उभा राहतो. या महिलांवर लाठी चार्ज करणारे कोण होते? जे आज आरोप करतात तेच होते ना? हे लक्षात येईल. संयुक्त समितीची नियुक्ती झाली, मात्र या लोकांना ‘जनलोकपाल’ विधेयक नको असल्याने श्री.शांती भूषण, प्रशांत भूषण यांच्यावर सिडीचे खोटे आरोप करायला या मंडळींनी सुरूवात केली, त्यावेळी सुध्दा किरण बेदीं प्रमाणे श्री.शांती भूषण, प्रशांत भूषण सांगत होते की , आम्ही दोषी असलो तर कायद्याने आमच्यावर कार्यवाही करा पण त्यांना माहित आहे की , कायदेशीर कार्यवाहीने आपला हेतू सफल होणार नाही, तर फक्त खोटे आरोप करून ‘टीम अण्णा’मध्ये फुट कशी पाडता येईल. जेणेकरून देशातील जनतेमध्ये संदेह निर्माण झाला की, पुढील आंदोलनात लोक पुढे येणार नाहीत. ‘टीम अणा’चे सदस्य निवृत्त न्यायमुर्ती श्री. हेगडेसाहेब एवढे प्रामाणिकपणे कार्य करणारी व्यक्ती ज्यांनी मुख्यमंत्र्यांनाही जेलची हवा दाखविली त्यांच्यावर आरोप करण्यात आले. कोण होते आरोप करणारे? लक्षात येईल की, हीच ४-६ जणांची चौकडी होती. अरविंद केजरीवाल यांच्यावर आरोप झाले एवढेच नाही सभेत चप्पल फेकणारे कोण होते? यांनीच उभे केलेले लोक होते. दि. १६ ऑगस्ट २०११ रोजी ‘जनलोकपाल’ विधेयकांची मागणीसाठी माझे दिल्लीमध्ये आंदोलन होणार होते. दिड महिन्यापेक्षा ही अधिक काळ आंदोलनासाठी जागा मिळावी म्हणून आम्ही सतत पत्रव्यवहार व प्रत्यक्ष भेटीतून प्रयत्न करीत राहीलो. मात्र जाणूनूबुजून दि.१५ ऑगस्ट २०११ पर्यंत आम्हाला उपोषणाची जागाच दाखविली नाही, दिल्लीमधील सर्व जागांवर खोडसाळपणे कलम १४४ लागू केला गेला. शेवटी नाइलाजास्तव आम्ही निर्णय घेतला की , आम्ही सर्व जणांनी स्वत:ला अटक करवून घ्यायची व जेलमध्ये उपोषण करायचे. या षडयंत्रामागे हीच सर्व मंडळी होती हे स्पष्ट दिसून आले आहे. दि.१६ ऑगस्ट २०११ रोजी सकाळी साडे सहा वाजता मला घरी येऊन अटक करण्यात आली. मी कोणताही गुन्हा केलेला नव्हता त्यामुळे घरी येऊन अटक करण्याचे काही कारण नव्हते. मात्र जाणून बुजून या मंडळींना माझ्या बदनामीचा प्रयत्न करायचा होता. दि. १६ ऑगस्टला मला अटक करण्यात येऊन तिहार-जेलमध्ये पाठविण्यात आले. अटक प्रक्रिया दुपारी चार वाजेपर्यंत पूर्ण झाली. तिहार जेलमध्ये आम्हाला नेण्यात आले, ४ वाजता आम्हाला खोली दिली,कपडे दिले आणि सहा वाजता अचानक एक अधिकारी निरोप घेऊन आला की , तुमची सजा माफ करून सुटका करण्यात आली आहे. तुम्हाला ज्या ठिकाणाहून आणले त्या ठिकाणी सोडायचे आहे. मी आश्चर्यचकित झालो की , माझ्या आंदोलनामुळे शांततेचा भंग होईल म्हणून अटक करण्यात आली असे सरकार म्हणते आणि दोन तासात मला सोडण्याचा प्रयत्न करते असा सरकारला काय साक्षात्कार झाला की , आता माझ्या आंदोलनामुळे शांततेचा भंग होणार नाही? हे सरकार आहे की काय? असा प्रश्‍न मला निर्माण झाला. मनाला वाटेल तेव्हा कोणालाही अटक करायची आणि मनाला वाटेल तेव्हा त्याला सोडूनही द्यायचे, हीच लोकशाही आहे काय? रामदेवबाबाला जनतेवर लाठी चार्ज करून रात्री २ वाजता ज्याप्रमाणे विमानात घालून हरिव्दारला नेले आणि दिल्लीमध्ये येण्यासाठी बंदी घातली व ते आंदोलन थांबविले अगदी तोच डाव माझ्यावर ही चौकडी करणार होती. मला जेलमधून सोडायचे व आणले त्या घरी सोडतो म्हणून सांगायचे आणि गाडीत घालून गाडी सरळ दिल्ली एअरपोर्टला न्यायाची यासाठी एअर फोर्सचे विमान तयार ठेवले होते. त्या विमानाने मला पुण्याला न्यायचे आणि पुण्यावरून अज्ञात स्थळी नेऊन ठेवायचे जेणे करून दिल्लीमध्ये आंदोलन होणार नाही. या मागे कोण होते? जे ‘टीम अण्णा’ची बदनामी करतात तेच होते ना? कारण या चौकडीची नियत साफ नाही. मला तिहार जेलमध्येच संशय आला की ज्या अर्थी दोन तासातच माझी सुटका करण्याचे नियोजन केले होते, त्या अर्थी यामध्ये काही तरी गौड-बंगाल आहे, म्हणून मी जेलमधील त्या अधिकार्‍यांला सांगितले की, मी जेलमधून बाहेर जाणार नाही, ज्या अर्थी तुम्ही मला सात दिवसाची सजा दिली, त्या अर्थी मी सात दिवस तिहार जेलमध्येच राहाणार. मी बाहेर जाणार नाही. सदर अधिकार्‍याने आपल्या वरिष्ठ अधिकारी डि.आय.जी यांना माझा निरोप दिला आणि त्यांनी ही सांगितले की तुम्ही जेलमधून बाहेर माझ्या ऑफीसमध्ये आल्यामुळे तुम्हाला आता परत जेलमध्ये जाता येणार नाही. मी त्यांना म्हणालो तुम्ही मला चर्चेसाठी बोलावलं आणि आता म्हणता जेलमध्ये जाता येणार नाही, ही बाब बरोबर नाही. मग मी त्यांना सांगितले जर जेलमध्ये मला जाऊ देणार नसाल तर मी जेलच्या गेटच्या बाहेरही जाणार नाही. मला धक्के मारून काढा अन्यथा उचलून गेटच्या बाहेर ठेवा. मी जेलच्या बाहेर जाण्यास नकार दिला आणि शासनामधील याच आरोप करणार्‍या चांडाळ-चौकडीचा डाव त्यांच्यावरच उलटला. रात्री एक वाजेपर्यंत अधिकार्‍यांचे शासनाशी संभाषण चालले होते. मात्र माझ्या निर्णयामुळे ते चांगलेच अडचणीत आले होते.त्यांना काहीच सूचत नव्हते. तीन दिवस मी जेलमध्ये ही नाही आणि जेलच्या बाहेरही नाही, डि.आय.जीच्या कार्यालयातच राहीलो, तीन दिवस आंघोळीची सोय नसल्याने आंघोळही केली नाही. त्यामुळे सरकारची नियत साफ नाही हे जनतेच्या लक्षात आल्याने जनता सरकारवर क्रोधित झाली. जेलमध्ये टाकण्याचे कारस्थान हे या चांडाळ-चौकडीचेच होते जे आम्हा सर्वांना सध्या बदनाम करीत आहेत. नाइलाजास्तव सरकारला रामलिला मैदान आंदोलनासाठी द्यावे लागले. जेलमधून बाहेर पडताना जो जनसमुदाय रस्त्यावर आला होता तो ‘न भूतो न भविष्यती’ असाच होता. ज्या ज्या वेळी या मंडळांनी खोडसाळपणा केला त्या त्या वेळी त्यांचा डाव त्यांच्यावरच उलटला आणि त्यांना अधिक बदनाम व्हावे लागले आहे. संयुक्त समितीमध्ये अडीच महिन्यात सात बैठका झाल्या ‘टीम अण्णा’ने केलेल्या मसुद्यावर सखोल चर्चा झाल्या आणि शेवटी हे खोडसाळपणा करणारे पलटले. ‘आम्ही तुमचा मसुदा कॅबिनेट समोर ठेऊ’ असं आश्वासन दिलं, मात्र कॅबिनेटसमोर फक्त सरकारचा मसुदा, जो कमजोर मसुदा आहे तोच ठेवण्यात आला. आमचा मसुदा ठेवलाच नाही. मी कॉग्रेस सरकारमधील सर्वच मंत्र्यांना किंवा संपूर्ण सरकारला दोष देऊ इच्छित नाही. आज सरकारमध्येही काही चांगली माणसं आहेत, मात्र या चांडाळ-चौकडीमुळे त्यांची गळचेपी झालेली आहे हे नाकारता येत नाही. आम्ही आमच्या टीममधील सर्व सदस्यांना पत्र पाठवित आहोत की संत, महात्मे, महापुरूषांना ही जनहिताचे काम करताना त्रास सहन करावा लागला आहे. आपण या चांडाळ-चौकडीच्या आरोपांना वेळोवेळी उत्तर देऊ नये. फक्त एकदा खुलासा केला की, सत्य काय आहे हे जनतेला समजते. पुन्हा पुन्हा आपण त्या संबंधाने बोलू नये. म्हणजे समोरच्या खोटे आरोप करणार्‍याला काहीच करता येत नाही. जनता भ्रष्टाचारामुळे त्रस्त झालेली आहे. भ्रष्टाचार किती वाढला आहे याची जनतेला चांगली जाणीव झाली आहे. त्यामुळेच तर देशातील जनता या सरकारवर नाराज आहे. भ्रष्टाचारामुळे महागाईचा भस्मासुर वाढला आहे, प्रापंचीक माणसाला प्रपंच करणे अवघड झाले आहे, आपण लढतो आहोत ते त्यांच्यासाठीच लढतो आहोत हे सुध्दा जनतेच्या चांगले लक्षात आलेले आहे. त्यामुळे या चांडाळ- चौकडीच्या खोडसाळपणाने केलेल्या आरोपाचा जनतेवर कोणताही विपरीत परिणाम होणार नाही. अनेक संकटाना तोंड देत देत पुढे जावं लागेल. सत्याच्या मार्गाने जाणार्‍या माणसांना त्रास होतो, मात्र इतिहासात सत्य कधीही पराजित झालेले नाही हे नाकारता येत नाही. त्यामुळे आपण सत्याच्या मार्गाने चालत रहा. आता ‘टीम अण्णा’ला कितीही बदनाम करण्याचा प्रयत्न झाला तरी ‘टीम अण्णा’मध्ये फुट पडणार नाही, या विचाराने आम्ही संघटीत झालो आहोत. खोडसाळपणाने आरोप करणारे आरोप कां करतात? त्यालाही काही कारणे आहेत. त्यांच्या हातचे अधिकार ‘जनलोकपाल’ विधेयकामुळे कमी होणार असल्याने त्यांना ते सहन होणार नाही, त्याचप्रमाणे ज्यांना या ना त्या मार्गाने ‘खाण्याची’ सवय लागली आहे आणि त्यांचे ‘खाणेच’ बंद होणार आहे अशा लोकांनाही ते सहन होणार नाही म्हणून ‘जनलोकपाल विधेयक’ (कायदा) कोणत्याही परिस्थितीमध्ये कायदा होऊ नये असाच त्यांचा प्रयत्न राहाणार आहे, त्यासाठी ‘टीम अण्णा’वर ते आरोप करतच राहाणार आहेत. मात्र अशा विरोध करणार्‍या लोकांची मंत्रीमंडळामध्ये संख्या कमी आहे. मात्र गावामध्ये ज्या प्रमाणे २/४ गुंड लोक संपूर्ण गावालाच वेठीला धरतात त्यातलाच हा प्रकार आहे. सरकारमध्ये चांगल्या विचारांच्या लोकांची संख्या जास्त आहे, मात्र ते यांच्या विरोधात बोलू शकत नाही अशी अवस्था आहे. ठराविक ४/६ लोक सोडले तर कोणीही आरोप करीत नाहीत. पंतप्रधान मनमोहनसिंग यांनी हिवाळी अधिवेशनात आम्ही ‘जनलोकपाल’चा कडक कायदा करू असे लेखी आश्वासनही दिले आहे, त्याचप्रमाणे प्रसार-वाहिन्यांशी बोलतांना त्यांनी आम जनतेला ‘जनलोकपाल’चा कडक कायदा करण्याचे आश्वासन दिले आहे. त्याच प्रमाणे कायदा मंत्री श्री.सलमान खुर्शीद यांनीही जनतेला खुले आम आश्वासन दिले आहे की , आम्ही हिवाळी अधिवेशनात ‘जनलोकपाल विधेयक’ हा कडक कायदा करू. यावरून एक गोष्ट स्पष्ट होते की, यांच्या सरकारमघ्ये चांडाळ-चौकडीपेक्षा चांगल्या लोकांची संख्या अधिक आहे. ज्याप्रमाणे ‘टीम अण्णा’वर ही मंडळी आरोप प्रत्यारोप करीत आहेत त्यांना या देशाचे समाजाचे काहीच देणे घेणे नाही. स्वत:च्या स्वार्थापोटी ही माणसं आरोप करीत आहेत. कठोर ‘जनलोकपाल’ आणू नये म्हणून सरकारवरसुध्दा ही मंडळी दबाव आणू शकतील हे नाकारता येत नाही यांच्या विचाराचे संसदेमध्ये थोडे फार लोक विरोधी पक्षाचेही आहेत, त्यांनाही हे हाताशी धरतील हे नाकारता येत नाही. मात्र या मंथनामधूनच लालबहादूर शास्त्रींची कॉग्रेस, वल्लभभाई पटेलांची कॉग्रेस, कामराज यांची कॉग्रेस उदयाला येईल असा मला विश्वास वाटतो. आज ‘जनलोकपाल विधेयका’ला विरोध करणार्‍या लोकांना जनता खडयासारखीच वेचून बाजूला करेल आणि तसं होणं, ही काळाची गरज आहे. या देशाला आणि देशातील जनतेला उज्वल भविष्य देण्यासाठी आणि भ्रष्टाचार-मुक्त भारत निर्माण करण्यासाठी ते जनतेला करावे लागेल. त्यासाठी वेळ आली तर मी सुध्दा देशभर फिरून प्रचार करीन. मी पंतप्रधान मनमोहनसिंग यांना पत्र पाठवून कळवित आहे की , ‘जनलोकपाल विधेयका’चा कठोर कायदा करण्यासाठी जो मसुदा तयार होणार आहे तो फक्त संयुक्त समिती पुरताच मर्यादित न ठेवता पंतप्रधान मनमोहनसिंग यांनी देशातील जनतेला पाहाण्यासाठी आधी इंटरनेटवर टाकण्यात यावा जेणेकरून जनता तो पाहू शकेल. स्व.पंतप्रधान राजीव गांधीनी ७३ वी आणि ७४ घटना दुरूस्तीपूर्वी देशातील साडेपांच लाख गांवाना पत्र पाठवून ग्रामसभेचा ठराव मागविला होता. लोकशाही, प्रजातंत्र किंवा गणतंत्र जेव्हा आम्ही म्हणतो तेव्हा जनतेला विश्वासात घेऊनच कायदे करायला हवेत. पंतप्रधानांच्या आणि इतर मंत्र्यांच्या आश्वासनाप्रमाणे हिवाळी अधिवेशनापर्यंत आंदोलन स्थगित करण्याचे ठरविले आहे. हिवाळी अधिवेशनात कायदा न झाल्यास सुरूवातीला विधानसभा निवडणूका लागलेल्या पांच राज्यात माझे दौरे सुरू होतील आणि नंतर राष्ट्रीय निवडणूकांमध्ये देशभर प्रचार करणार आहे. मात्र या अवधीमध्ये देशातील सर्व जनतेने आपापल्या ग्रामपंचायत आणि ग्रामसभेमध्ये, ‘जनलोकपाल’ विधेयक हिवाळी अधिवेशनात आणावे अन्यथा पुन्हा आंदोलन करावे लागेल, अशाप्रकारचे ठराव करून पंतप्रधान मनमोहनसिंग, सोनिया गांधी, राष्ट्रपतींजी यांना पाठवून द्यावेत. देशभरातून किमान ३५ ते ४० लाख ठराव जावेत. ‘जनलोकपाल’ विधेयकाचा ठराव करतांनाच राज्यासाठी ‘लोकायुक्त विधेयक’ आणावे यासाठी राज्याचे मुख्यमंत्री,राज्यपाल यांनाही ठराव पाठवावेत. ‘लोकायुक्त विधेयकां’चे आदेश भारत सरकारकडूनच जाणार आहेत. पण त्याआधी आपल्या मागणीचा ठराव आपापल्या राज्यातील मुख्यमंत्र्यांना व राज्यपालांना पाठवावा. वेळ कमी असल्याने सदर ठराव शक्या तेवढया लवकर पाठवावेत.म्हणजे खोडसाळपणा करणार्‍यांच्या खोडसाळपणाला आळा बसेल. भ्रष्टाचार-मुक्त भारत निर्मीतीसाठी हीच संधी आहे, ‘अभी नही तो कभी नही’!, सरकारने पुन्हा जर ‘जनलोकपाल विधेयक’ आणण्यात कसुर केली तर आज या सरकारची जे नुकसान झाले आहे त्यापेक्षाही अधिक नुकसान होईल. मात्र कठोर ‘जनलोकपाल विधेयक’ कायदा केला तर सरकारचे जे नुकसान झाले आहे ते भरून निघेल असे आमचे मत आहे. गेली २५ ते ३० वर्षे आम्ही कोणताही पक्ष, पार्टी, व्यक्ती न पाहता समाज, राज्य, राष्ट्राचा विचार करून आंदोलन केली आहेत. यापुढेही याच विचाराने पुढील आंदोलने होत राहणार आहेत. इन्किलाब झिंदाबाद !! वंदे मातरम ! भारत माता की जय ! जय हिंद!